I recently had the pleasure of interviewing Doctor Ron Paul on my Anarchast channel which I had wanted to do for a long time! I asked Dr. Paul several questions including, perhaps most importantly, his thoughts on the future of the Federal Reserve, financial markets, and bitcoin. Dr. Paul emphasizes the importance of keeping bitcoin legal and allowing the people of every nation to choose and to maintain complete control over whichever medium of exchange they see fit. And, I have to tell you that before, during and after the interview, Ron Paul was one of the most humble, intelligent and easy going people I have ever met. It truly was a special honor to have met him. Also as a friendly reminder, you have just 10 days left to get an early bird discount for this years Anarchapulco conference, which if you didn’t know, is the largest voluntaryist/anarcho-capitalist conference in the world held every February for four years running in sunny Acapulco, Mexico. If you’re just starting to learn about things like bitcoin and cryptocurrency you will be happy to know that we have an entire day devoted exclusively to cryptocurrencies called “Cryptopulco” and it is included in the cost of your ticket! And the day after Cryptopulco, on February 19th, is the full day Dollar Vigilante Internationalization & Investment Summit where we’ll have the great Ed Bugos speaking on the state of the economy, markets and gold stocks as well as numerous other amazing speakers in the precious metals, cryptocurrency and internationalization space. P.S. Today is Dr. Paul's birthday and we'd like to wish him a happy 82nd! Keep spreading the message of liberty! This post received a 4.1% upvote from @randowhale thanks to @maxsteem! For more information, click here! Ron Paul started me on this journey I have a lot of income for. I share some of the same feelings about Ron Paul too. It's complicated. I guess pretty much everyone is against the ruling power. This might also include some people who are at the very top. They do what they can with their limited freedom. I think its not about being against the ruling power, its more about not having control of whats yours. The ruling power is not taking initiatives to make sure people have control over their money. He will forever be a hero of liberty's cause. Our children will remember his name, and they will tell their children about him. He has been at the tip of the spear in the fight, and I will forever respect him for his effort. On the World Stage some play the good guys but ultimately seem all part of a script the Directors have in place, sometimes even unknowingly. It comes down to if you think the Koch brothers (who fund the Libertarian-Republicans) are true Freemarket Capitalist, or Part of the "Illuminati-Bilderberg-Bohemian Grove-George Soros-Rothchild-Clinton-Bush-Skull and Bones-Reptilian-Elitists." Jokes aside, maby the powerful 1%s all competing for power and not nearly as unified as conspiracies theorist want to believe. Not necessarily working for the other team. Ron Paul is very passionate, I've watched many of his senate and public speeches. He truly believes in his convictions. I think the big powers "allow" people like him to run so they can target the "angry" voters with better efficiency in the next elections. Candidates like him will never win because they are temporary tools used by the system, to improve the system. I remember watching Ron Paul talking about the dollar collapse over 10 years ago, and I agree that it may be one of the biggest reasons why I'm here! Ah ha, my suspicion that you truly have an altruistic bent have just gone up quite a few notches @dan. Thanks for what you've done and hopefully will do in your continued endeavors. You deserve everything good that's coming to you @Dan Thank you for everything you do! No matter who won in 2016, the US was headed for turbulent times. Clinton's approach was unlikely to be quietly accepted. Did you just post your random article on someone else's post? A most likely plagiarized article at that? Peace, prosperity, and freedom, such foreign concepts to government and the governed. I love Ron Paul, he's a voice of reason in a world of crazy. What hope I have, that Ron Paul sees an end to this monstrosity of bipartisan rule of intimidation! Someone ought to introduce Ron to Bitshares and let him know 75% of Wall Street is obsolete. The Bitshares DEX is currently doing about $20M/day in trades with no government, no corporation and no middleman. Can't be hacked, there are no 'circuit breakers', just 24/7 global trading the way it was meant to be. @dollarvigilante this is a nice post and all the best for future on steemit.. This is a good idea and highly informative. Ron Paul is liberty's Hercules. That's not an exaggeration either. He has done more than most and has furthered our cause greatly. His efforts have awaken millions of people to the truth too. He was a huge part of my awakening, and I could never thank him enough for everything he's done for me personally. What he's done for liberty is priceless however. No one could ever repay him. He'll forever be a legend in the history of our fight for liberty. Generations from now, people will smile and nod as they remember him. They will thank him even then. Years ago I donated publicly to his campaign, and that was one of the top Google hits when people looked up my name. Some people used that against me. I wear it as a badge of honor. Where he leads, I will follow. If he needs an extra spear, mine is his. Thanks for interviewing him, @jeffberwick. I know you're in the fight as a fellow Liberty Professional too, and I thank you for your effort! Edit: I'm upvoting my own comment, something I do not normally do, to get it above the 25 rep spammers. Don't follow American corporation politics because I'm from Croatia and politics is scam in general, but I heard nice things about Ron Paul. Didn't listen him so far, but I did now for the first time on Anarchast. What he said I already know. What fascinate me is that they allow this guy to be apart of congres for that many years. Don't know much about political election system, so I'm wondering how that happen? I heard about case of black woman Cyntia Mckeney (not sure about name), she was trow out from congres. Don't remember exactly what and how, that is so interesting they are allowing Ron to be there. I would love to vote for Ron Paul! Great interview! What goes up will go down. A crash after SPX500 400% upward from 2009 is not far fetched. HBD Ron Paul. I remember our enthusiasm about Ron Paul's candidacy in 2008. So many people supported him. It was incredible. It was from him that I first heard the call to Audit the Fed. I certainly hope that Ron Paul is proven right concerning issues like the end of the Fed or that "if offered peace and prosperity through non-violent foreign policy," that we will accept it. But unfortunately, we live among many who place security (Obamacare, for example) above individual sovereignty. Will continue to hope and to spread the knowledge to others. Thanks so much for this interview. We need more Berwicks and Ron Pauls in the world! Amen to that @ch4nel. Upvoted and following. They have tried so very hard to demonise him but his voting record is impeccable, always votes in line with his stated common sense beliefs. Been a fan of Dr. Paul for a long time. Can't help but feel if he were in charge now the whole world would be a better place. 82 years old! Happy Birthday Mr Paul. Heres to many more! it was amazing ,,,after I watched this video, hopefully his way of thinking can be an exemplary mind for the people.. Very interesting interview @dollarvigilante. Unfortunately, in some parts of DR Ron Paul's isn't clearly audible (or is this just a problem in my network anyway?). Great interview @dollarvigilante. He is a great man and this interview reminds me of several stories about my interactions with Dr Paul and his 2 presidential campaigns, thanks for bringing back those memories. I'll try to get at least one of them posted today. Moral defense of Liberty is very powerful. I just love the way this guy thinks. He is a great man and we in the anarchy/voluntary/liberty movement will one day look back on his career as a kindling point of that movement. Awesome that you got Ron Paul on! A living legend! Just like thousands of others, I owe it to Dr. Paul for bringing my understanding of liberty to where it is today. We need many people like him. God bless him. 82 years old and strong enough to offer another interview. Awesome! Shame he could not have been elected. Americans in general are too marginalized and are heavily indoctrinated with the whole left vs right paradigm, that any independent would never receive adequate consideration, not too mention media blackout. I like Ron Paul too and I saw him on Info Wars. Ron Paul was, is and always will be a SAVAGE. Respect this dude for sure. A voice of reason in an otherwise turbulent world. We need more people like Dr. Ron Paul. I am new in crypto, in fact this is my first coin the steem and looking for bitcoin too. I need to look closely to cryptopulco I think, and as a starter I prefer to watch your video to learn more. About Ron Pual, he is the President, U S.A is needed, a man that open to change and willing to accept change as a demand. I so sad to know, his now terminal phase of his life. Ron Paul Is the real deal! Happy birthday dr ron paul, good luck always .. you really are a decent figure to follow, and I love you full????? For those who know less about Ron Paul- Ronald Ernest Paul (born August 20, 1935) is an American author, physician, and former politician. He was the U.S. Representative for Texas' 14th and 22nd congressional districts. He represented the 22nd congressional district from 1976 to 1977 and from 1979 to 1985, and then represented the 14th congressional district, which included Galveston, from 1997 to 2013. On three occasions, he sought the presidency of the United States: as the Libertarian Party nominee in 1988 and as a candidate in the Republican primaries of 2008 and 2012. Paul is a critic of the federal government's fiscal policies, especially the existence of the Federal Reserve and the tax policy, as well as the military–industrial complex, and the War on Drugs. 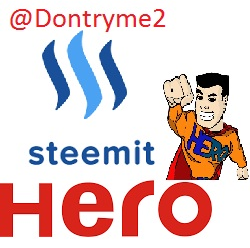 I Say Welcome And Happy To You Here #steemit or#eSteem. Vote @good-karma As Our Witness. I would like to express my gratitude. Wow, the reserve markets is indeed a booming one. i hope to meet him too someday. I like your post, nice posting and very interesting, i has read, invite and resteem your post, I'll be right back, thanks. Ron Paul was the president we needed in the USA. Sadly we got Trump... Could have been worse with Hillary.... Americans making the same mistakes. Insanity. Its was actually his Son Rand that was running, but yes you are right! Write-ins would have been nice. what a legend! His 2012 campaign was my wake up. I was a socialist before lol how misguided I was. Great interview and interesting information. Steem On brother! Which means BTC won't be 0 dollar each !!! Oooooo I have to share this with my family! They LOVE Ron Paul!!! Great share! Amazing interview keep it up. I met Ron Paul at a gold conference in San Francisco, opened my eyes on being a libertarian and gold bug. Dr. Paul is a true patriot and a man of vision and wisdom. Guys like him are vanishing quickly and becoming a rarity. It is good to see you on this platform. As usual, you give us things that the mainstream media are loath to deliver. Dr. Paul's insight is, as always on point. I was wondering if you, like Dr. Paul have any intentions of running for president. I know that you have relocated, but, as far as I know there has never been an anarchist candidate who ever really stood a chance. I would hope that Dr. Paul would try again, but he said he has given up. It would also be great if you could have an interview with Peter Schiff. Sorry if you already did that one. He has some strong views on Bitcoin and I would love to hear you put some questions to him on the issue. I have similar interests like you. I am just beginning to write on a number of issues. I am at @nicholas1983. I look forward to hearing from you. this is one of the best post that i seen before. thank you for your great interview. a lot of thing that i found your post . that really amazing.i follow you. Yes Dr. Ron Paul is a very intellectual man. He looks just like my great grandfather to lol. @dollarvigilante I could still remember when they released the Ron Paul coin. Those were the wild days of cryptocurrency. Is he a steemiter? I hope he will be the President. Roll on Freedom for the People! Great interview @dollarvigilante. It saddens me to see how the rest of America cannot see that this man speaks the truth and should be our president. I Wonder What Would Happen To Bitcoin If It Becomes Part Of The Federal Reserve ? We need more Ron Paul's in this world. Ron Paul great guest to have on your show. Ron Paul is a symbol of liberty to me. Bitcoin is one of the secure and prosperous currency i'd known. 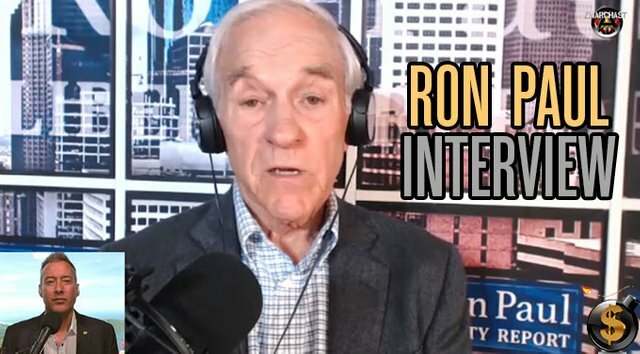 I really enjoyed this interview with Dr Ron Paul! :) Thanks Jeff! Ill need to look that up . Happy Bitrhday Ron Paul! and kudos to @dollarvigilante another fine article my friend. Keep 'em coming! Listened yesterday! He's my hero! He started me down the path that eventually led me to crypto! Same here, Ron Paul is my hero. Hi @dollarvigilante! Thanks for sharing the interview it great! So that means there's a bright future in investing bitcoin now even the price is so high right? what is your feeling about him? ?